The expo and conference witnessed the huge footfall of people from the industry of Outdoor advertising. The SOTI Conference was an exclusive forum for Brand custodians, Outdoor media players and Technology providers to explore emerging technologies in Digital Analytics, Retail Signage, DOOH, MROI and Transit Advertising. The expo had more than 500 exhibitors from pan India showcasing their products. Starting from the digital printers to the digital signage facility providers. The event had two day conference as well where the industry leaders shared insights regarding the new trends in outdoor advertising. 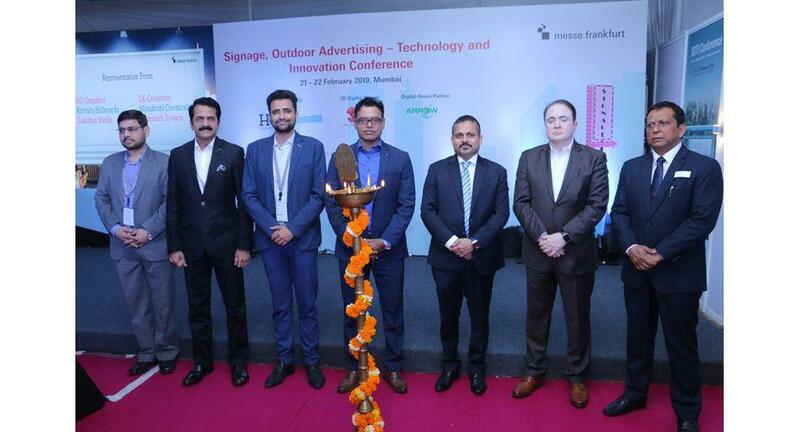 Outdoor has always been the prime mode of advertising and new innovations are providing options to advertisers, which was elaborated by the various speakers present at the conference. The conference was interactive at various levels where audience got the chance to exchange thoughts. Day 1 – Dhruv Talwar, Head of Brand Strategy, Godrej Properties talked about ‘Future Perspective of Brands on streets. He talked about how real estate has always been inclined towards outdoor advertising and new innovations has helped in generating new business. Sudhir Soundalgekar, Director & Head, Projects, Raymond Apparel Ltd. On other hand emphasized on how store presentation work in increasing the footfall and the sale. He spoke about how ‘Experience Design’ is the new key and focus on Empathize, Define, Ideate, Prototype, Test, and Acceptance. Digital signage has revamped the look and feel for Raymond. Sam Patel, Director, Arrow Digital elaborated the latest trend and said Wide Format 3D Printing is the next big thing. Now India is moving towards becoming the smart city and digital signage plays a vital role in it. Arrow digital are pioneers in it and hence Mr. Patel focused on Wide Format 3D Printing, Display Graphics & Sign, Soft Signage, Interior Décor and Direct-ToGarment Printing. Day 2- The day begun with another set of key industry officials like - Mr. Shriranga Sudhakara, Founder & Managing Director, Vyoma Media; Mr. Jayesh Yagnik, Chief Operating Officer, MOMS Outdoor Media; Mr. Srikanth Ramachandran, Founder and CEO, Moving Walls and many more. Shriranga Sudhakara, founder of the most innovative digital company Vyoma Technologies talked about how DOOH is more than just digital screens and now reaching to the mobiles phones in real time. For better consumer engagement there is a convergence of digital – social media amplification. According to him now DOOH has reached to that level where real time customer engagement is of high importance. Srikanth Ramachandran, Founder and CEO, Moving Walls talked about measurement, which has always been a challenge for the OOH industry. He tossed a very important term for the audience i.e. MROI (Marketing Return on Investments). He suggested points on how to catch more attention of your audience? How you get to know your responses and how this is measured. Pradipta Chowdhary, Sales Lead, Fujifilm India did an interesting session on ‘Emerging Technologies in Inkjet Print Platform’. Fujifilm is a pioneer in the printing industry and it was very insightful to learn the innovations. During is session he told why inkjet printing is the emerging trend, Print on a far broader range of substrates. It opens the door to a new world of creative possibilities. It reduces a lot of time-consuming finishing work and much more. Ankit Shah, Marketing Head, Can Image Media, talked about why reducing PVC is important in the country. The two day conference witnessed the presence of many other known names from the industry like Kinjal Rambhia, Vice President, Xtreme Media; Manish Kumar, Sr. VP and Managing Director, APAC, Stratacache; Indrajit Sen, Consultant, IOAA; Sharad Bhaurao Bande, Superintendent. Licensing, Municipal Corporation of Greater Bombay and many more. The conference covered 360 degree aspect of outdoor advertising, which was very insightful. There was a footfall of more than 500 people at the 2 day conference & 3 day exhibition each day. Messe Frankfurt India has initiated something which was never done before i.e. diverting the industry focus towards the oldest medium that is outdoor advertising and signage.The expo not only gave a platform to the mid-sized OOH vendors to showcase their services but also opened new gates for the small vendors to interact with their potential customers. This was a first kind of an outdoor advertising conference & expo where regulators, though leaders, service provider and advertisers came together and exchanged the valuable inputs. Apart from the Mumbai edition, SOTI will be organized in Delhi on 6-8 September at Pragati Maidan. By any chance if you have missed the Mumbai edition then block your calendar for the Delhi edition.